This past IMAC 2005, in Chicago, has grown in attendance from its inception. This year it had approximately 500 guests. For those who were unable to attend, IMAC will be offering video and DVD tapes of the speaking events. For those interested, Doug Robbins will be reviewing these in a future issue. Among the many fine topics addressed by the speakers, the one that had special meaning for me was Julian Sprung’s, entitled The Old Tank Syndrome. About 40 years ago we spoke of the “New Tank Syndrome,” which had to do with the problem of making a new tank habitable for marine fish, which led to our understanding of the vital role of the bacteria needed to mineralize toxic ammonia. Today our ability to maintain sea life in good condition has grown enormously, to the point where we are able to establish beautiful reef tanks that are populated with a very wide variety of invertebrates and vertebrates. However, our very success has uncovered other problems when it comes to reef keeping husbandry. Based on his own extensive experience and that of other experienced reef keepers Julian observed that as reef tanks age, despite water changes, carbon and other forms of chemical filtration, skimming, substrate cleaning, and various additives these aging reef tanks appear to lose their capacity to support the range of sea life that they did initially. Although these observations by Julian and others are by their very nature anecdotal, they appear to hold more than a grain of truth. The question, however, is what is responsible for this syndrome? Testing the typical water purity parameters has not revealed anything of significance. Julian’s talk did not offer any definitive answers, but raised many possibilities, not the least of which is a gradual shift in bacterial populations, dominant corals changing the water chemistry to benefit themselves, but detrimental to other species, etc. In a future issue we will present Julian paper. I’m beginning to think I ought to break down my reef tank, reestablish it with new water, substrate, and live rock. With a 10-foot reef tank such an idea practically gives me an anxiety attack. Some of the corals have grown so large I doubt if I could get them out of the tank without breaking them. 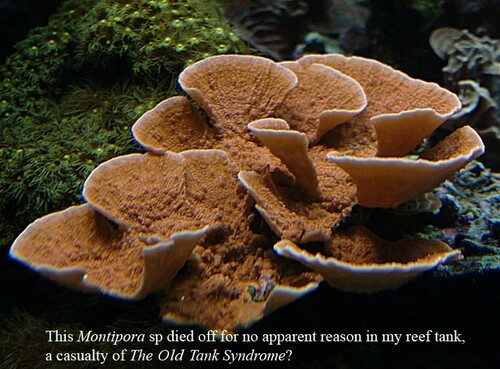 How many of you have comparable experience with aging reef tanks? Let’s hear about it.